An emerging branch of technological research, designing and constructing nanobots will have incalculable implications in science and industry. Also known as nanorobots, nanites, or nanomachines, these devices are in the development phase and only primitive nanomachines have been tested. The term nano describes a length of measurement equal to one-billionth of one meter which is approximately the width of 10 atoms. The resulting miniature robotic machines may be as small as a few molecules in length or width. Although the genesis of the term nanobots is unclear, two descriptions may apply. First, a nanorobot is a device, synthetic or biological, that is able to function on a near atomic level and perform a preprogrammed task. A less restrictive description would be a device that facilitates interaction on a nanoscale level. Rather than only describing an infinitesimally small machine, this characterization would include a scanning tunneling microscope and other similar microscopes that can be used to manipulate nanoscale structures. Nanotechnology is the name of the branch of engineering concerned with engineering nanobots. By virtue of the fact that nanorobots may be made from almost any type of material, the manufacturing processes being researched are varied as well. The two principle manufacturing conventions are top down or bottom up. The former process involves the extreme miniaturization of existing robotic devices while the latter describes a process of building starting at the atomic level and constructing any object one atom at a time. Specialized nanorobots known as assembler nanobots will be required to create more sophisticated units. Theoretically, the assemblers would use the bottom up approach and stack atoms upon each other in layers to form the desired nanomachine. However these assembler units have yet to be developed. Current technology has employed atomic force microscopes and scanning tunneling microscopes to arrange atoms. The scanning tunneling and atomic force microscopes from the scanning probe family and the transmission electron microscope from the electron microscope family, not only can resolve specimens at the atomic level but have been used to move atoms and molecules. Initially, the microscope is used to precisely locate the particle that will be moved. Then, a higher electron force than is normally used for imaging is targeted on the particle. This needs to be done in a vacuum and at very low temperatures approaching four degrees Kelvin to inhibit electron excitation and spatial uncertainty caused by temperature drift in the room and between the specimen and the probe when using a scanning probe microscope. These constraints illuminate the limit of the efficacy of this technology to construct nanobots. Anecdotally, scientists at IBM used a scanning tunneling microscope to rearrange 35 xenon atoms to form the company logo. Scientists are studying the self-replicating properties of DNA as a mechanism for the creation of these nanorobots. Researchers created a rudimentary precursor to a functional nanobot from synthetic DNA and, following this line of research; scientists are trying to engineer DNA strands to independently combine in a predetermined manner to form a nanomachine. This nascent nanobot had two arms and would rotate in response to a chemical reaction. A few hurdles stand in the way of manufacturing useful nanobots. From the top down approach, the most daunting obstacle is the power supply. Batteries and solar cells are not viable solutions for this problem. Nuclear power, in which a thin layer of radioactive material is painted onto the surface of the nanorobot, may be one solution. The nanites can absorb energy from the decaying atomic particles. 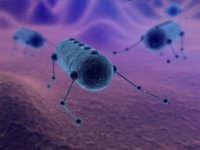 Biological nanobots could be engineered to ingest insignificant amounts of body tissue to obtain energy. Regardless of the design method, a nanorobot will ideally perform its task and then dissolve so the body can absorb and excrete it. For several reasons silicon is a good choice for the construction of nanobots. It is durable, flexible, and conducts electricity; however it will not dissolve in body fluids. Since these devices are so small, swarms of them will be necessary to perform most tasks. To perform certain tasks, especially in medical applications, controlled mobility is another issue. Often mentioned medical uses of these devices include plaque removal and cardiac repair. They must migrate to a predetermined site and remain in that location to complete the task. Another requirement of a useful nanomachine is that it operates autonomously, independent of outside control. Physical, electrical, and chemical reactions can produce a response but the introduction of these stimuli rob the device of the advantage of independent operation and they also can produce a response in the nanobot’s surrounding environment. An inherent drawback to producing these devices is their size. Building atom by atom and molecule by molecule is tedious and doesn’t lend itself to mass production. At the other end of the manufacturing spectrum, miniaturization of synthetic devices will require advances in metallurgy since the building materials will need to be reduced to a nanoscale. By consensus, nanobots will find their first applications in medical science. Also known as nanomedibots, these machines will be able to repair damaged or diseased tissues at the molecular level. The circulatory system is a natural highway for these devices and the nanomedibots will cruise through the blood stream to the area of distress. They may be used to attach themselves to specific cells, such as cancer cells, and report the position and structure of these tissues. A creative theory in the use of these devices to fight cancer involves using silicon nanomachines with a thin coating of gold and light in the near infrared spectrum. Light in the 700-1000 nanometer range will pass through tissue with minimal absorption. When this near infrared light strikes this particular type of nanomedibot, the device gets hot due to the oscillation of the metal’s electrons in response to the light. Using an MRI to precisely place the nanomedibots in the cancerous region, the light causes the devices to heat to 131 degrees Fahrenheit which destroys the cancerous cells but doesn’t damage surrounding tissues. Also regarding cancer treatment, ribonucleic acid interference is a method that attacks cancers on a genetic level. Nanobots laden with interfering RNA that deactivates the protein production of the cancer and kills the malignancy would attach themselves to the tumor and deliver the lethal genetic material. In addition to removing plaque from arterial walls, they could also be used to find areas of arterial weakness. 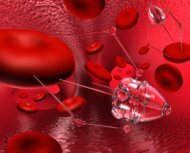 Nanorobots may also be employed to detect specific chemicals or toxins and could give early warning of organ failure or tissue rejection. Also used to take biometric measurements, they may be employed to monitor the general health of an individual. These devices may find application in a variety of industrial applications. Research is ongoing into using them in the oil industry. In addition, current research is investigating their application in nanophotonics to produce light more efficiently. Computer circuits may be produced by these tiny devices. They could create circuits on a smaller scale than current etching techniques and would allow for the manufacture of extremely small processors and chips. Broadly speaking, nanobots may be synthetic or biological. The goal of some scientists has been to create a completely mechanical nanorobot; however, a hybrid device possessing biological and robotic features may be the most practical idea. To qualify as a true nanite, the device will have to have mobility, the ability to process information or to be programmed, and have a power supply. Ideally, it would also be able to self-replicate. Scientists envision the manufacture of a functional nanite in approximately 25 years.